12oz (2 cup) Capacity: ONLY $28.99! 24oz (4 cup) Capacity: ONLY $29.99! 48oz (6 cup) Capacity: ONLY $32.99! 66oz (8 cup) Capacity: ONLY $38.99! Need multiple quantities or express shipping? Fill out our form below. Genuine Brown Betty teapots must be made of a special red clay. The unit pictured here is made in that manner, long cherished in England as the best way to make a "good cuppa." These teapots are made in Straffordshire, England, just as they have been for over 300 years. During Queen Victoria&apos;s reign, tea became a symbol of Britain&apos;s greatest period of expansion and stability. Every home owned a teapot, even if it was a basic "Brown Betty." Tea was no longer a refined, upper class beverage but a basis of a whole meal. While Charleston dancers and many Victorian glamour&apos;s have disappeared from the scene, the humble "Brown Betty" teapot has still remained a firm favorite. Its origins go back to the end of the 17th century and to the birth of the British Ceramic teapot, although in 1700 an ordinary small unglazed teapot of Red Clay from the Bradwell Woods area in Stoke-on-Trent was a luxury item costing about 12 shillings. 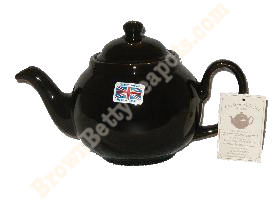 Brown Betty Teapots are still made in Stoke-on-Trent, formed from clay, which comes from the same area where elder Brothers found clay in the year 1695. The method of producing was "Jolleying" but over the years it is now modified to slip casting which gives the pot an even thickness and smooth finish both inside and out. Succeeding generations of englishmen have proved that the Brown Betty, as these Red Ware teapots are affectionately known, make the best pot of tea in the world. The shape of the pot causes the tea leaves to be gently swirled around as the boiling water is added, thus producing an exquisite infusion. The Red Terracotta Clay with its Rockingham glaze, coddles the brew and gives the perfect cup of tea.